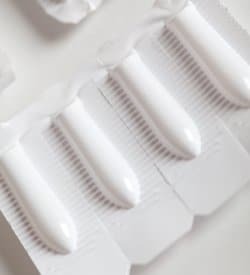 From a compounding pharmacy perspective, Suppositories are a fantastic medication delivery system. What you might not realise is the complicated nature of making them. They are one of the most time consuming and intricate dosage types to compound. Firstly, we have to prepare the moulds (which the product cools in) and this involves painting each mould with oil using a fine paint brush. Once the product is melted and all of the ingredients & base are combined, it is time to measure the amount of product that is going to fill the mould. You can only measure out enough to fill one mould at a time as the product solidify quickly and gets stuck in the syringe. Once you have filled 60 to 100 moulds you are feel stiff, sore and cross-eyed. The suppositories will cool and then you need to remove them from the mould without breaking them. This part is very intricate and its very important to not break any as there are not always spare suppositories made. Finally its time to wrap each suppository individually. The foil needs to be cut to size and each one individually wrapped. Like we have said earlier, its a very intricate process but the type of product can be used in a number of situations when Patients are not able to swallow normal capsules. If you would like to speak to one of the National Custom Compounding team about how our Compounding Pharmacy can tailor a dosage type to you, please give us a call 1300731755 or Email.